One of the world’s largest refugee camps is evolving into an urbanised city. Zaatari Refugee Camp in Jordan has become an informal city, with a do-it-yourself metropolis of roughly 85,000 residents with emerging neighbourhoods, gentrification and a growing economy. Although the camp is approaching normality, each refugee longs to return home to Syria. Zaatari has created an entire new way of thinking towards one of the world’s most pressing issues. According to United Nations High Commissioner for Refugees annual report, the total number of refugees worldwide in 2013 topped 50 million, a figure substantially increased by the Syrian conflict. The report states it has become evident that these refugee camps should be treated more than just a transitional population centre, or human holding pens, but rather a potential city for these broken refugees to live. A number of forward-thinking aid workers are looking at refugee camps as potential urban incubators, places that can grow and develop and even benefit the host countries. the United Nations official in charge of Zaatari, calls it, the most fascinating project on earth when it comes to the development of camps. The Syrian and Iraqi families who have found themselves facing extended exile in a place like Zaatari, have begun to cater for their own needs. Don Weinreich, a partner at Ennead Architects in New York said you can call a place like Zaatari impermanent and not build adequate infrastructure, but organic development, driven by refugees is unstoppable. “Impermanence costs more in the long run. 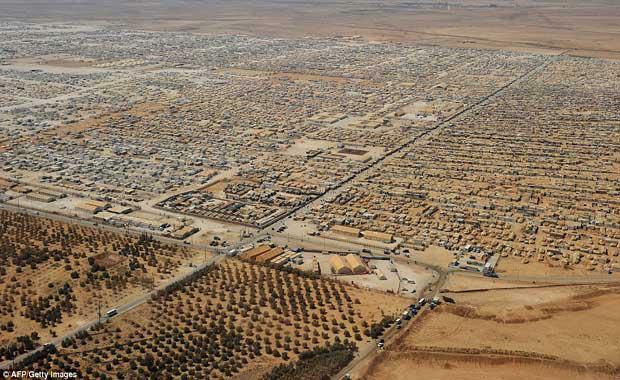 Zaatari is a squalid, barren, crime-ridden place, with most of the businesses and shops being unauthorised. 14,000 households, cobbled together form shelters, tents, cinder blocks and shipping containers. According to Daniel Kerber of Morethanshelters, what is happening at Zaatari presents opportunities as the camp evolves into a complex ecosystem that could be called a city or slum. An empty police station disappeared from near the camp entrance one night, its trailers repurposed as homes and shops two days later. Refugees at Zaatari receive the electricity that powers their shops and washing machines for free, creating a $750,000 a month burden for the United Nations. Mr Kleinschmidt persuade shop owners to install circuit breakers, and he is now working on a plan to institute a monthly fee for shop owners and refugees with electrical and water supplies – in effect, slowly formalising the camp’s economy, an approach both fair and politically savvy. The Jordanian community is benefitting from the Syrian influx, with the government receiving $1 million per day in international aid, alongside with Jordanian landlords, banks and small businesses. However, the lower-class Jordanians, who pay for their utilities, complain that Syrians steal jobs, drive up rents, overcrowd schools and drain resources. A sign that Jordanian officials may be coming around to this long-term thinking is a recent promise by the Ministry of Environment to deliver several thousand trees to the camp. “We design refugee camps; refugees build cities,” Mr. Kleinschmidt said.